As more and more people turn to e-books for their reading pleasure, the argument is often made that the experience of reading in print is more effective than reading online. While this may be true, these arguments leave out an important dimension – the bookstore. Those who read online miss out on the actual bookstore experience: being there, communicating with other customers, and getting advice on what to buy. One only had to go as far as Milton last weekend to see this spirit in action, as The Word Bookstore celebrated its fortieth anniversary in the heart of the Milton-Parc community. The family-run business was filled to the brim with some 200 friends and customers who came to celebrate. Between the cake-cutting that took place in the middle of the room (baked by a friend of the shop) and the coming and going of the large crowd there to congratulate the family, there was hardly a spot for a book-lover to enjoy the collection. The Word has been working to develop this community bookstore space for the four decades it’s been around. Opened in 1975 by a young couple, Adrian King-Edwards and Lucille Friesen, the store is now run by their son, Brendan King-Edwards. The bookstore was a labour of love for the couple, who wished to share their infatuation with books with Montrealers. Before opening The Word in its current location, the couple ran an ‘underground’ bookstore in their living room on Milton, with a picture of George Bernard Shaw taped tellingly to the window. In a video interview with the Montreal Gazette, the older King-Edwards remembered that The Word’s current location was previously a laundromat. Half-joking, half-concerned, he pointed out that for a good six months after the store opened, people would come in with their laundry and be very disappointed to see books there instead. This didn’t last long, however, and soon The Word was winning community awards for enriching the local literary landscape. The Word creates a feeling of being ‘frozen in time’ when you shop there. With neither music nor advertising distracting you, it’s a place for musing and discovering. “[The idea] came out of a very grassroots community type of atmosphere, with my dad and my mom having people over to buy books in their apartment,” Brendan told The Daily. The initial aim of the shop was to provide a literary space for young poets, especially for anglophones in a largely francophone community. In its first years, the store amassed its customers by hosting poetry readings, book launches, and storytelling evenings, community gatherings that The Word still host today. Now, forty years later, one would guess that not all that much has changed. The bookstore maintains an antiquated aesthetic, cozy and mysterious. While the main floor overflows with books, an attic upstairs contains some very rare specimens that truly appreciative collectors can select. The shop also has a strict policy of paying in cash only, in part because electronic payment “does not really go with the whole aesthetic of the store.” It also allows the owners to avoid dealing with the increasing prices associated with bank transactions, even if it means using “ancient accounting methods,” as Adrian puts it. The owners are not fond of corporate competition, and they try to keep the experience exclusively about the books, with no intermediaries like banks involved. In this way, The Word creates a feeling of being ‘frozen in time’ when you shop there. With neither music nor advertising distracting you, it’s a place for musing and discovering. 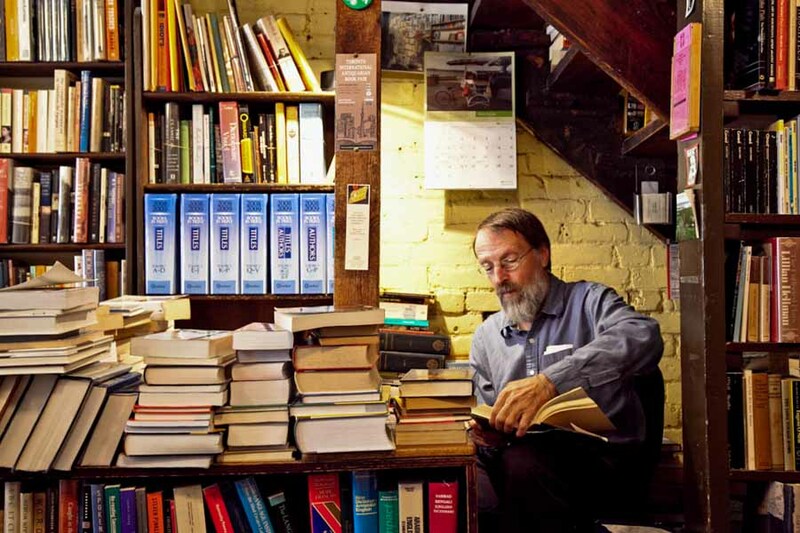 And those who are unsure of anything can always chat at the checkout desk with Scott Moodie, a book connoisseur who has been working there for 25 years and has read more books than all of The Word’s owners combined. Unlike the other bookshops around McGill, The Word is not focused on serving university students. Although it does provide a shelf of academic material for students, it prefers to attract customers with its rare, carefully selected collection of secondhand books and treasures. “More than anything, we […] attract a certain kind of individual – whether they are younger students or older customers – and they are really serious readers. […] Often they do not have a lot of money and they want to build their libraries, and it’s a good place to do it,” Brendan explained. It’s not surprising that a store that focuses so much on quality over quantity is frequently lauded as the best secondhand store in the city. This welcoming attitude was reflected in the openness and warmth that characterized The Word’s birthday. The event more closely resembled a friendly get-together than a party for a profitable business, encouraging all to stay and enjoy the wine. With great enthusiasm and a bit of shyness, Adrian thanked everyone for allowing the bookstore to thrive for so many years, especially the store’s devoted friends. As the years have gone by and print has lost its popularity, The Word has cultivated its unique image and purpose in the Milton Parc community, remaining a staple for local book-lovers admist all other changes. In a world of internet book reviews, The Word instead focuses on doing what it does best, making it a landmark in Montreal and a safe haven for all sorts of passionate readers.